They may be a small part of the extreme macro apparatus cosmos that you need, but adjustable flash shoe mounts are so difficult to find and there are so few writeups about them that I think it's worth adding a writeup of them, if for nothing else than to make people aware of them, and of their limitations. 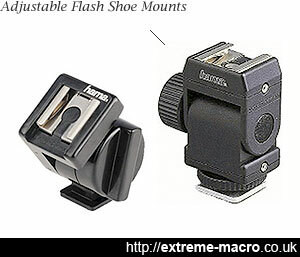 Hama adjustable flash shoe mounts. They're not exactly the sturdiest of items and top of the range flashes are beyond them if used without additional support. The older model without PC sync option is on the left. And boy do they have limitations. They're badly made, flimsy, unstable, and don't have contacts. But they're about the only thing that's out there for my purpose, having a horizontal flash rather than a tall vertical one. My field setup for extreme macro consists of a flash that lies horizontally over a camera with a small diffuser on the end, rather than a flash sticking up on the end of a flash bracket with a massive great diffuser perched on top. I find it easier to use this rig rather than a conventional one mainly for manoeuvrability reasons. When you're trying to poke a lens in towards a bug that's inside the trumpet of a flower, or under an especially inaccessible leaf, then the smaller and more manoeuvrable that your rig is, the better. So to make your rig small you want the flash to extend out as little, and you need to lie the thing flat. Short of using another means to make sure that it won't fall off the end, your options become severely limited in terms of what you can use to make sure that it doesn't fall off. This is where an adjustable shoe mount comes in useful: it lets you angle the flash at 90° to the camera yet still keep it somewhat steady. So the best way to think of one of these things is more as a mechanical hinge, not so much as a flash connection. The Hama Universal Flash Adapter (on the right above) has two PC female sockets and a hot shoe on the top. There's a swivelling hinge between these that the user tightens with a plastic screw mount. To use, you connect the flash to the camera using a PC sync cord. You can also daisy chain flashes and have a PC sync cord running to a second if so desired. Although it is nicely sized, the unit's construction is made from all plastic and it just wasn't strong enough and didn't last. If it were made from solid metal with a good tightening knob it would have been perfect. This the predecessor and the one on the left above, and lacks the PC-sync connectors. Unfortunately the metal of the actual shoe on the top came off when my flash was on it, the glue isn't strong enough. I am lucky that this did not break my flash. I'd hoped that with the bigger tightening handle it might have been stronger but it did not turn out that way at all. It also lacks the tightening mechanism at the bottom so isn't as sturdy in the camera's hotshoe either. Shame. There are other right angled flash swivels available beyond these Hama units, which I don't have personal experience of. If you're looking for one, they might be worth your time googling. Suntron do a PC-sync flash swivel mount that looks much like the later Hama version but with a metal foot. Stitz do various flash swivels, the most modern of which looks to be on the tall side, but some of their older models look very good. Giotto do studio flash mounts and whilst tall, it may suit your purpose. Soligor did a very solid bounce head 25 years ago which looks to be the most robust and compact of the lot, but it is hard to find. Beyond that, there are many flash swivel ball head units on eBay, and experimentation with configurations of these might help you find the perfect unit for your setup.